In October 2012 I sent an earlier draft of this summary to Dr David Bale of SNH (Scottish Natural Heritage), after informing him of severe damage to soils, ancient pines and understory vegetation by heavy timber machines in August 2012 within the Glen Tanar National Nature Reserve. Derek Pyper had taken photographs of the damage on a visit weeks later in October, and I sent copies to Dr Bale. 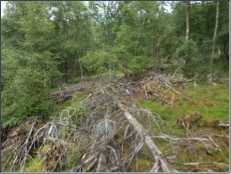 It was manifestly clear from his reply and subsequent correspondence that staff in the Tayside/Grampian region of SNH and the north-east region of Forestry Commission Scotland (FCS), as well as on Glen Tanar Estate, and the Cairngorms National Park Authority (CNPA) were unaware of the long-term adverse impacts of such damage. This summary was intended as a factual account for their benefit and, I hoped, ultimately for the benefit of the ancient Old Caledonian pinewoods of Scotland. These are our special and unique Scottish remnants of the boreal or northern coniferous forest, which covers vast tracts across North America and Eurasia in a wide circumpolar band south of the Arctic tundras. The deep ruts, mud and pools along the tracks made by timber machines are conspicuous eyesores, detracting from landscape and scenery. So are the piles of branches, stumps, unused felled trees, and standing dead trees that are left. This leaves the ground at best difficult and unpleasant to walk across or ski across, and frequently impossible without risk of injury. When the last ice age vanished from Scotland, the ice left a land devoid of plants and animals. The rocks and glacial deposits are called minerals, the adjective being mineral. To judge from evidence from the Arctic and elsewhere, bacteria, algae and fungi soon colonise newly emerged glacial deposits. The dead material from this living skin then becomes colonised by tiny animals, fungi and bacteria living on the dead material and decomposing it. Plants later colonise. Dead material from plants is called litter, forming a distinct layer (soil scientists call each layer a horizon) or L horizon. As litter becomes decomposed, material below the L horizon is the Fermentation or F horizon. Below that in turn, there is often a black H or humus horizon. Underneath it come the A horizons, A1 first and then A2. So far, all horizons are organic, from living material, often called topsoil by gardeners. Below come mineral horizons, B1, B2, B3, all affected to some extent by chemical and other reactions in the upper horizons. Finally comes the C horizon or parent material, unaffected by actions in the horizons above, and representing material essentially unchanged from the original bedrocks or glacial deposits. Soils are therefore a mixture of organic and mineral components, undergoing changes within the soil that lead by natural evolution over centuries to soils that reach steady states. By the term soil development, soil scientists mean this development to a steady state. Here I describe impacts that are less well known than those on landscape, scenery and recreation, but insidious, severe, and likely to be catastrophic to the pinewood ecosystem in the long run. By ecosystem I mean the term as defined by ecological scientists, including not just the trees but also the understory vegetation and the soils below. All three: trees, understory and soils, evolved together for thousands of years since the last ice age vanished from all of Scotland. They all depend upon one another for the sustained existence of all three. I have been studying these impacts in the field since the late 1990s, with numerous photographs which also show changes in the same sites across some years. Deeside, Speyside and neighbouring areas are within the podzol zone in the world's main climatic soil zones, shared with most of Norway, Sweden, Finland, northern European Russia, and northern North America. There, an excess of precipitation over evapo-transpiration (evaporation and transpiration of water by plants to the air) in a cool climate, combined with acidic bedrocks or acidic glacial deposits from such bedrocks, leads to a podzol soil type. Northwards towards the pole, the main soil type is a tundra soil, and in Scotland the equivalent is our tundra-like or alpine soils in the high Cairngorms. In colder regions such as much of Siberia, northern Canada, northern Alaska and the high Arctic, the soil is permanently frozen except for a thin surface skin in summer. That skin is an infertile thin black gellisol lying above the permafrost. Further south than the zone of the podzol soil type, one finds a brown soil resulting from deciduous forest, often called a brown earth and far more fertile than a podzol. In some regions with grassland as the natural vegetation, a deep chernozem or black earth has resulted, well known in the North American prairies and in eastern Europe including Ukraine and eastwards in Russia. Within any one of the major soil types, such as podzol, sub-types occur, in Scotland with iron podzol, iron humus podzol, peaty podzol, gleyed podzol, and others. These are associated with increasingly poor drainage and/or increasing precipitation and colder temperatures, often at higher altitudes or further west in Scotland. Podzols have developed for thousands of years since the last ice age. In Norway, Sweden, Finland and northern European Russia, Scots pines dominate the forest on freely drained land and Norway spruces on poorly drained bogs. In Scotland our boreal woodland is dominated by Scots pine naturally, with Norway spruce occurring only where it has been planted. Apart from several well-studied exceptions, the typical soil resulting from the cool wet climate and acidic bedrocks in northern Scotland, as elsewhere in the boreal zone, is a podzol. The exceptions are a) where gravity on steep slopes or severe disturbance by mammals such as rabbits has prevented soil development to a podzol, b) where a parent material of base-rich bedrock or glacial deposits derived from it has led to other soil types such as a brown earth, c) where flushing from groundwater springs brings a continual supply of nutrients, d) where alluvial deposits from streams have led to nutrient-rich surface soils, and e) where prehistoric cultivation or other anthropogenic disturbance of surface podzolic horizons has led to surface horizons that resemble a nutrient-rich brown earth with earthworms and molehills, above an anomalous clearly podzolic orange-brown B2 horizon and a paler brown B1 and B3, the B horizons being often loosely called 'subsoil'. Underneath the B horizons is the C horizon, often called the 'parent material' because it has not been affected by biological and chemical activity further up and hence resembles closely the original material laid down by the glacial ice during the last ice age. Rivers coming from the ice washed out much of the clay and silt in the glacial deposits under or beside the glacier, resulting in excessively drained sands and gravels. On excessively drained soils, on skeletal soils composed mainly of rock particles, and on freely drained gravels, one pass of a timber-felling machine compacts the soil greatly within each wheel rut. This can be seen well at the mature planted Scots pinewood at Craigendinnie on Glen Tanar. The compaction destroys the upper horizons of the podzol as separate recognisable horizons or layers, including the humus horizon and the classic ashy-grey A2 horizon that gave the podzol its Russian name. Heavy timber machines also invert the horizons frequently, so that the upper horizons are moved underneath lower ones. During site inspections at Glen Tanar pinewoods in June 2007 with head ranger Eric Baird, and with capercaillie ecologist Dr Robert Moss, soil scientist Sandy Walker and myself. Sandy Walker said that any ground disturbance disrupts the very acidic horizons in the upper soil of pinewoods, which would be adverse to heath and would favour other species. The measurable exchangeable cations of the important nutrients were almost zero in the upper organic horizons of undisturbed pinewood soils. The B horizons are far less acidic. This explains why any inversion of B on top of A by timber machines is inimical to the continuation of the understory of heath with pinewood feather mosses and lichens, and instead favours atypical pinewood species such as Yorkshire fog, Sphagnum and Polytrichum mosses, foxgloves, ferns including bracken, rushes and brambles. Modern heavy timber machines are of two kinds. One, a tree harvester or feller, cuts the trees and removes branches, leaving the trees on the ground beside each route or 'rack' taken. The second is a forwarder, which picks up the felled trees later and transfers them to piles in its back section. Modern machines can weigh 20 tonnes, and a 20-tonne forwarder can carry up to 20 tonnes of timber, hence a total of 40 tonnes. If the ground is soft, operators fit chains on the wheels, a combination which causes greater damage to soils and vegetation. In three cases where an owner wished branches or 'brash' to be laid by the machine operator in front of the wheels, this reduced the depth of ruts, but the effect was cosmetic, limited to a band 100 yards by the public road. Also, the long-term impacts from decomposing dense concentrated brash have not been properly studied. 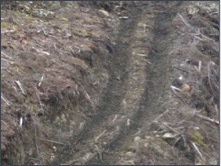 All ruts from timber machines, as from any vehicles, lead to bare ground, and consequently increased water runoff and soil erosion. However, the main effect of compaction, via the disruption of the very acidic upper horizon of podzols as described by Sandy Walker in the previous paragraph, is to destroy the podzol's ability to support the classic pinewood understory vegetation, This is dominated by heath species such as blaeberry, heather, bell heather, cowberry and pinewood feather mosses and lichens. The compaction along with the disruption of the original horizons including frequently their inversion, leads to colonisation by a wider variety of plants atypical of Scots native pinewood, such as bramble, wild raspberry, creeping bent, rushes and wetland mosses in wet spots, and bracken. Inspection several years later reveals no material change outside the ruts, if they are on freely drained or excessively drained soils. This amounts, however, to a substantial proportion of the wood when machines are used to clear-fell. Even when they are used to 'thin' (in fact clear-fell along linear routes that are separated by untouched unthinned trees) and the routes are commonly about 10—20 yards apart, the next round of 'thinning' doubles the area affected by ruts. Hence, after a third or fourth round, a high proportion of the surface is affected greatly. During a visit to Craigendinnie at Glen Tanar in 2007, as part of the site inspections reported two paragraphs back, I showed the ruts and underlying soils, and the soils on unaffected ground nearby, to the party. Sandy Walker was very concerned, and said that the use of the machines was a severe threat to the maintenance and integrity of the Old Caledonian pinewoods. The podzol was the foundation stone for this ecosystem, and the destruction of its key acidic upper horizons would be irreversible and irreparable. Mr Baird was then Deputy Convener of the CNPA, and Mr Walker pleaded with him to reduce or ban machines in the old native pinewoods at Glen Tanar and elsewhere in the National Park. We subsequently heard nothing further. In autumn 2011 I organised a site inspection on Mar Lodge Estate, owned by the National Trust for Scotland (NTS), after Derek Pyper and I came across a feature that seemed to me to be probably of archaeological interest, while on a walk in lower Glen Quoich. I phoned senior ranger Peter Holden to tell him what I had found, and we agreed to have a site inspection. We discussed this with property manager David Frew in a meeting room at Mar Lodge, when Peter introduced me to David Frew and I introduced Derek Pyper to Mr Frew, and also soil scientists Sandy Walker and Rodney Heslop. After we had finished the preliminary inspection of the feature, Sandy Walker said to Peter Holden that he hoped the NTS would not use large timber machines in the Old Caledonian Forest because of the irreversible damage to the pinewood podzols. Mr Holden assured us that the NTS would not use such machines in the Old Caledonian remnants, and had used them only in plantations. This seemed a satisfactory reply at first sight. Later, it occurred to Sandy Walker and me that the NTS, through its reductions of the population density of red deer, aimed for the spread of Old Caledonian remnants at Mar Lodge Estate into the plantations by self-seeding. Hence, although Scots pines would continue, this was only a part of the pinewood ecosystem, and the machines in the plantations would have destroyed the podzol, disrupted the water table, and changed the vegetation so that it no longer fitted that of the circumpolar natural boreal forest and instead had become an anomalous unnatural anthropogenic type. So far, only a small proportion of the plantations has been damaged by large timber machines. However, portents for the long run are gloomy, unless NTS were to ban further use of big machines and use horses for proper thinning with minimal impacts on soils and vegetation. On imperfectly drained gravels, such as at an old planted pinewood at Brathens near Banchory, owned by FCS, ruts were deeper but generally still restricted in the first year to wheel tracks. At the end of the first growing season, intact pinewood-floor vegetation remained in the middle between the tracks and on the outer side of each track. The A2 and humus were clearly evident in the vertical face exposed at the top of each rut. However, it became obvious in later years that compaction in the ruts had disrupted the water table. Within a few years, water destroyed the podzol horizons, and plants typical of wet conditions replaced most of the heath, such as rushes, sedges and Sphagnum. The aim had been to increase natural pine regeneration by thinning, but one can now see that no young trees are growing on the wet damaged soils, whereas patches of unaffected ground that still has heath vegetation show prolific natural regeneration of pine. In many places, ruts and hollows have become pools with standing water, often permanent. The disruption of water tables and increase of standing water cause water-logging, and in turn this leads to wind-throw of trees with roots in the water, as well as poorer growth of nearby standing trees. In many other pinewoods, impacts of the machines are severe also on poorly drained soils or very poorly drained soils, with ruts up to two yards deep, serious runoff and soil erosion, and creation of extensive wet bogs and expanses of standing water where none existed before. Recent examples can be seen at the FCS woodland in Glen Nochty of Strathdon. This inevitably will depress future tree growth and lead to premature wind-throw. SNH, FCS, CNPA, and other conservation bodies such as NTS ought to have been aware of the above impacts and taken action to restrict the use of machines and ban them in sensitive areas such as Glen Tanar with its Site of Special Scientific Interest, National Nature Reserve, National Scenic Area, National Park, and EU conservation sites Special Area of Conservation and Special Protection Area. I hope they will do so now. Every year of new destruction puts in greater jeopardy the pinewood ecosytem, the pinewood landscape, and the many specialist pinewood wildlife species which are an integral part of that ecosystem and which depend on it. In Scotland, much is stated by FCS, SNH, CNPA and government ministers about sustainability and about sustainable forests and sustainable forestry, indeed stated far more often now than 10 or 20 years ago. This is also the case with the Forestry Commission in England. Such usage is inaccurate misleading hypocrisy. The increasing use of timber machines is the very antithesis of sustainability, and the frequent emphasis by FC, FCS, SNH and CNPA on the terms sustainable and sustainability is an insult to the public, including the taxpayers who fund these organisations. In recent years the FCS, and FC in England and Wales, have publicised and promoted The UK Forestry Standard and The UK Forest Stewardship Standard, intended to raise standards of management in FC woods and privately-owned woods, and claimed to involve independent monitoring and certification. This too is fraudulent. In every case out of scores visited by me (Watson 2015) on FCS land and privately-owned woods, several conditions in the two Standards were breached. This usually involved 6-8 conditions, occasionally up to 10. Further window-dressing and cover-ups, expensive to the taxpayer, seriously mislead the public and governments. The use of large timber machines poses a grave long-term threat to our Old Caledonian pinewood ecosystems, because the machines destroy those ecosystems irreparably and irreversibly wherever they go. This must be banned to prevent further irresponsible damage.